PETALING JAYA (May 7): Three developers who have demonstrated a commitment to the sustainability of their properties were honoured at EdgeProp Malaysia’s Best Managed Property Awards 2018 tonight. AME Development Sdn Bhd, Paramount Property Development Sdn Bhd, and S P Setia Bhd Group received the EdgeProp Malaysia's Responsible Developer: Building Sustainable Development Award 2018. The inaugural award by the editors of EdgeProp.my recognises property developers who are committed to building developments that are designed and built for best-in-class property management. The winners have demonstrated commitment to building properties that meet the needs of the present and future without compromising on the building maintenance. AME Development director Simon Lee said: "We are pleased, honoured and humbled to be a winner of the award. This prestigious Award recognised our company efforts in building a sustainable development and will definitely motivate us to be more innovative and further increase our initiatives to be a responsible developer. "Being a managed industrial park developer, we reaffirm our commitment in providing a secure work environment with complete infrastructures that take care of customers’ current and long-term needs. We believe in continuous improvement of our industrial park concept so that it is sustainable and incorporates work and play features to attract a new generation of talented work force." Paramount Property CEO for property division Beh Chun Chong said they were honoured to be recognised for their effort. "At Paramount Property, we want to be a people's developer and we always offer total solutions for our customers. "We believe that not only do we want to build properties, we also want to make sure that we minimise the maintenance and cost for our customers after the development is completed, especially in strata properties," he said. S P Setia president and CEO Datuk CJ Khor said: "All of us at S P Setia are extremely proud and honoured to receive this award as we have always taken cognisance of sustainability in our developments. Right from the start of our master planning, we consider and give importance to the different aspects of sustainability such as the environment, community, social impacts and financial viability of the development. We are glad our efforts have been recognised. EdgeProp Malaysia’s Best Managed Property Awards recognises buildings that showcase excellence in property management. Into its second year, the awards are open to any strata or non-strata buildings in Malaysia that are managed either in-house of by any property manager. There are nine categories in two divisions – less than 10 years and more than 10 years, based on the age of the projects. 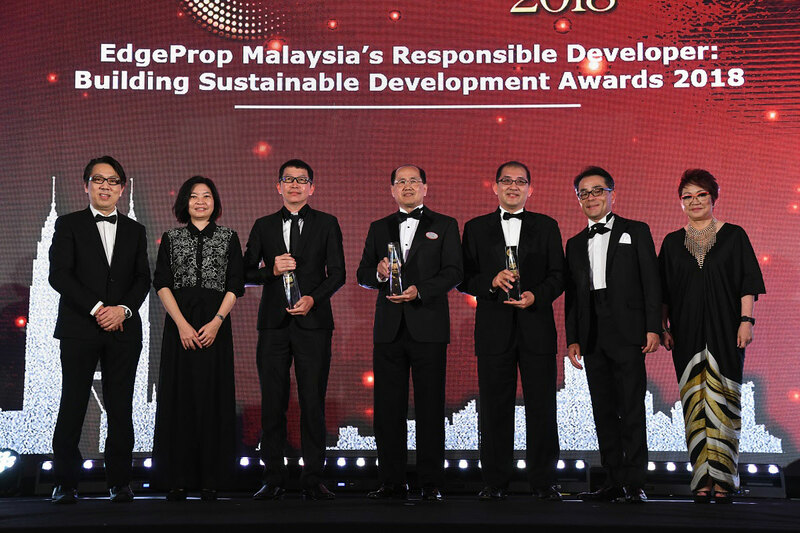 EdgeProp Malaysia's Responsible Developer: Building Sustainable Development Award 2018 is one of two new awards introduced this year, the other being EdgeProp-ILAM Malaysia's Sustainable Landscape Award 2018.